Up until a few years ago I could not cook. Living in Vancouver’s West End, I was surrounded by restaurants and cafes and take-out places, and so didn’t really need to cook, and at the time, it just never really occurred to me that cooking could bring me so much joy (in fact at the time I faced the prospect with a tinge of terror). The only “cooking” that I did was more along the lines of heating things up and then combining them on a plate, and one of my favourites at the time were vegan Sloppy Joes. I would get a pack of veg. Mince, a jar of pasta sauce, heat them up together and slop the resulting mass onto a bun. I had forgotten all about this past favourite until the other day when I was trying to figure out what on earth I actually did eat at the time. The vegan Sloppy Joes flooded back into my consciousness like an old friend. The time had come, now with a love of cooking at the heart of it, to reinvent this recipe into something magnificent. In my recent mission to eat less processed foods, I don’t really eat the pre-made veg. meat alternatives anymore -not that I mind having them from time to time, but when you’ve embraced foods in as whole a form as possible there are so many beautiful alternatives that there’s never really any need for it. So for the base of the sloppy filling for my Joes I opted for lentils. I’m a big fan of pulses in all of their forms really, but I must say that lentils are probably top of the list. They are really versatile, and because of their texture and flavour, they are, in my opinion, an ideal meat substitute. Plus, while they don’t contain as much protein, on a nutritional level when compared to red meat there are great benefits such as the fiber content, lack of cholesterol, and higher levels of many vitamins and minerals, including iron. Our bodies need vitamin C to be able to properly absorb iron from our food, so adding tomatoes to the lentils is a perfect combination. To the sauce I added flavour with carrots, celery and onion, a bit of smokiness with smoked paprika, and a touch of sweetness and tomato sauce tang with maple syrup and a splash of balsamic. Served on top of some beautiful fresh buns, this recipe was an absolute delight. 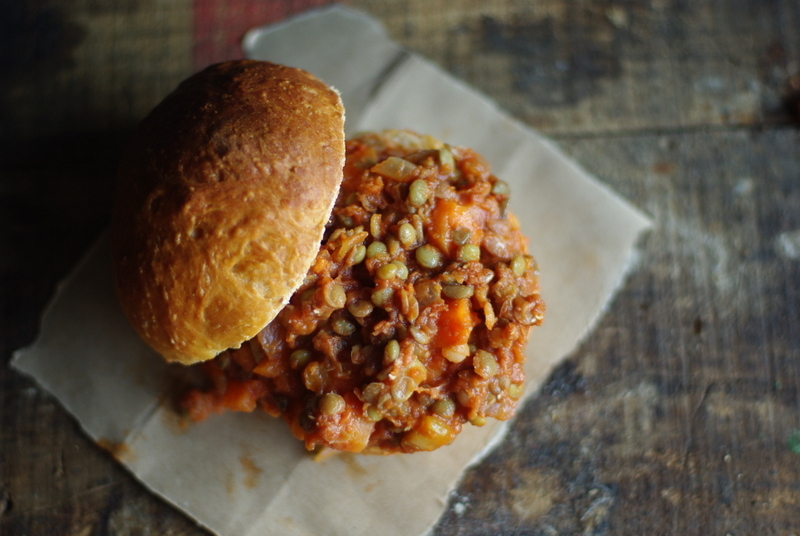 In its new, lentil laden form, I can see vegan Sloppy Joes regaining its title as a go-to staple meal in our house! These sloppy vegan sandwiches are loaded with nutrition from lentils and tomatoes, and are rich, smoky, tangy and a little bit sweet. Pile the filling on a beautiful fresh roll for a satisfying classic meal. In a large pot over medium heat, heat the oil and then add the onion, carrot and celery. Cook, stirring occasionally until the veggies are getting soft, about 10 minutes. Add the tomato, tomato paste, maple syrup, soy sauce, paprika and balsamic vinegar. Stir well and allow it to simmer, stirring occasionally, for about 15 minutes. Stir in the lentils and cook for a further 5 minutes, or until everything is piping hot. Warm the rolls, split them open, and put a large scoop of the lentil mixture inside. Replace the lid of the roll and serve immediately.